if you’ve been following this blog for a while, you’ll know that this is one of my favorite spins. it’s soft, yet easy to handle, which makes it great for the beginning spinner and fun for the more advanced spinner. 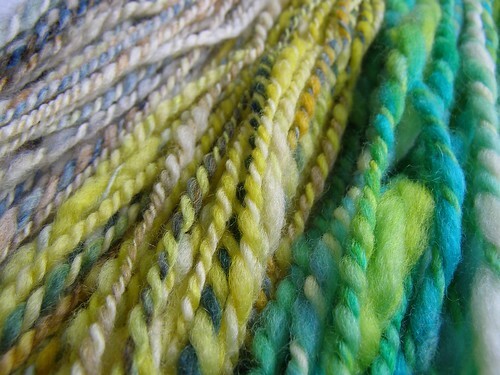 here’s a picture of a bfl lock of fleece i found on flickr. bfl is considered a longwool (look at the aforementioned lock to see why!). one of the fabulous characteristics of longwool is that not only do they have a long staple length and therefore an easy handle, but also lots of luster and serious durability. all of these add up to a great multi-purpose wool that can be used in garments you want to drape and shimmer a bit, or in something durable where you want a bit of luster and a nice feel. you are more likely to find imported bfl than domestic, although it is picking up over here. i managed to find one small farm at maryland sheep and wool that i plan to call up next time i need some. 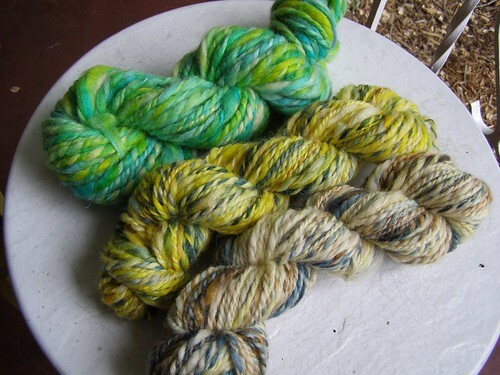 personally, i was unable to resist these skeins. 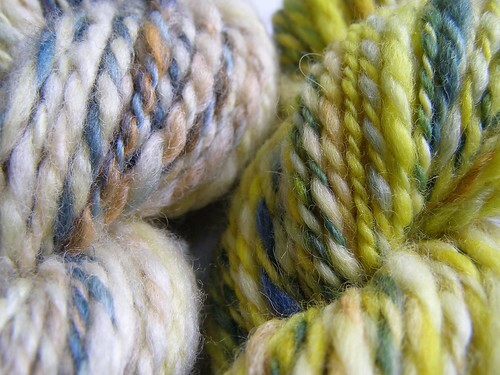 when i have a silly craft fair (the may market in this case), i cheer myself up by picking a skein (or two!) that i get to knit with if they don’t sell. beings that it is a silly craft fair, they probably won’t sell and i’m seen balling them up with joy shortly after arriving home. i think that on day three, i started knitting with the yellow. these two were crockpot mates – obviously from the other side of the track from one another. i first fell for the white, then the yellow with it’s springing like colors… and with the luster of the bfl, it was all over. i’ve been planning a set of reduce, reuse, recycle hats for a long while now and finally got around to embroidering this one. 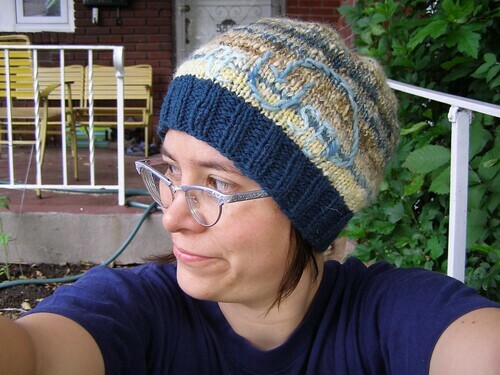 for this hat i took advantage of the aforementioned drape inherent in bfl and made this hat big so that it could flop a bit. 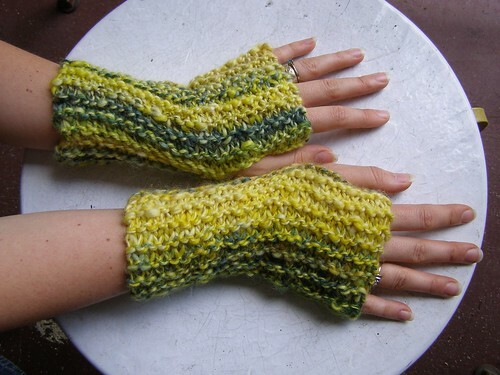 i think i knit these on a 10.5 US needle. 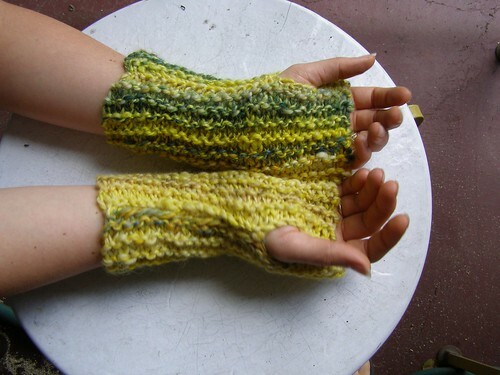 for that reason, they are stretchy and fit both my husband’s hands and mine! i’m really beginning to like this wrister thing – there’s freedom in not having to make these windproof and if i have a really fun small quantity of yarn (especially handspun! ), they’re a perfect solution to showing it off. ben and i thought they went well with my bullshirt. i’m also excited to see more and more bfl show up in commercially produced yarns too – mostly because it will help the breed keep existing and expanding (and i think it’s dang nice wool!). 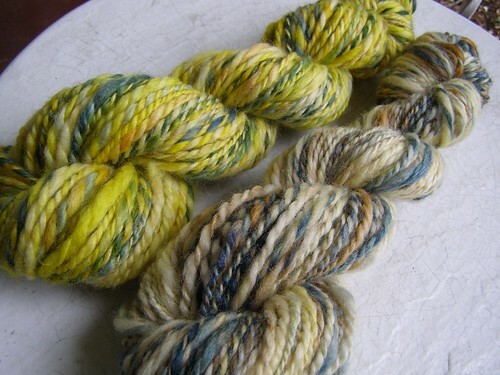 superwash bfl is now available through many indie dyers and from fleece artist. -this shawl is going to have gorgeous drape! i’m hearing many people switch from merino to bfl for socks because of the durability factor. 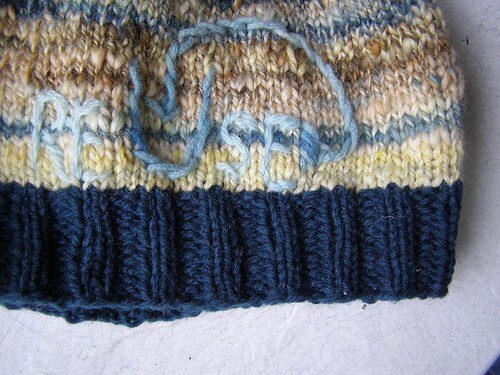 longwools are also less likely to pill because it takes a lot more to pull pieces of wool out of the yarn. 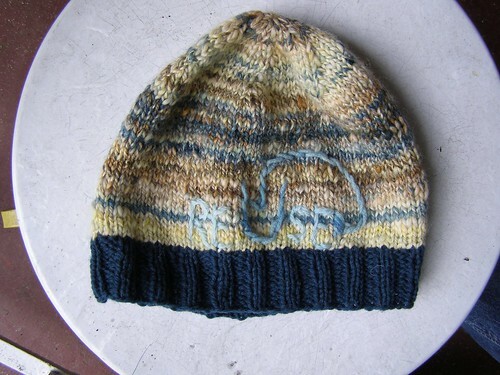 This entry was posted in cosyknitsliterally, cosyspins, handspun, hats, knitting, mittens, spinning by cosymakes. Bookmark the permalink. I second the awesome review! 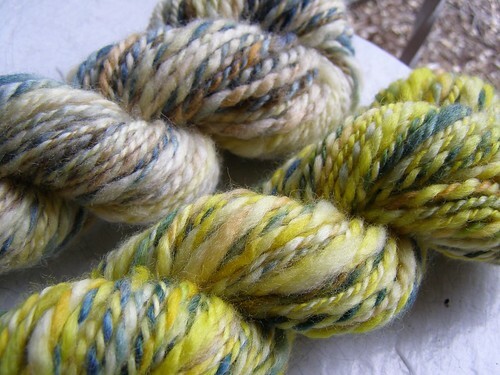 BFL is a fantastic fiber to spin. It’s just such a smooth yummy magical experience! I’m still wild about those wristers. You’ve got such lovely hands for modeling. 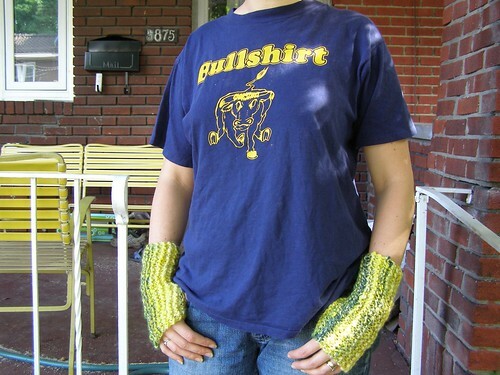 :D Your hands in fingerless mitts was one of your first pictures I saw on flickr. hahah!